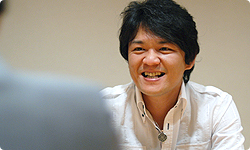 Fujioka-san, if someone who didn’t know anything about Monster Hunter suddenly asked you what kind of game it is, how would you - as simply as possible - answer? As simply as possible? I’m not sure. That’s difficult. I suppose I’d say, “It’s a hunting game.” But I guess a lot of people might not quite get what I meant. When you hear “hunting game,” you get the impression of something savage. Yeah. When you talk about hunting, you get an image of something incredibly severe, but in making the game, I worried most about not letting it become too brutal. If a game is excessively brutal, the gameworld gets too forbidding and isn’t a comfortable place to be. The actual actions you perform within the game are heavy in their own way. But while it’s that kind of world, you get various kinds of enjoyment out of it. I wanted to make a world that wouldn’t be brutal. You can do whatever you want, so the heavier aspects aren’t oppressive. That’s what I had in mind. Of course, the overarching theme is hunting, so everyone moves with that objective before them. However, there’s some leeway, some freedom. You can go fishing if you want. The home console series is especially like that. It’s got a lot of leeway. Dinosaurs are exciting for adults as well as children. That inspires you to enter into this world, and when you do, you find it’s an enjoyable one. I like that. To put it another way, I always think of this game as a theme park. Once you go in, you find a fun world, and just doing something there is fun. Hunting in a theme park? You’d get in trouble if you did that! (laughs) But I do love theme parks. Once you enter, it’s a different space. You don’t particularly gain anything from it, but just being there is fun. I understand. Just like a theme park, there’s a comfortable world, and monsters live there. You can hunt them, but those who don’t want to can go fishing. If you encounter a monster you can’t defeat on your own, you cooperate with others to defeat it. And after you beat it, you receive a reward. That’s fun, so lots of people keep playing. That’s what the Monster Hunter games are about, right? Yeah. (laughs) That’s what I was trying to say. But I imagine most people who don’t know anything about it think they have to hunt. Yeah. It’s got bones with meat on them. There’s a lot of freedom in that world. Mammoths are stomping around all over. You slice off their meat and eat it, but you wouldn’t really call it brutal. It’s actually sort of warm and laid back. You chop off some meat and gobble it up like it’s delicious. That easy-going outlook is very human. I like that feeling of just eating what you want to eat. I wanted to convey a sense of how fun that type of thing can be. So everyone gets together and casually enjoys hunting. 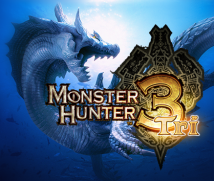 How did you decide on the title Monster Hunter? Originally, it was the development code. But we didn’t know if we could get the rights to the name. Or rather, we were certain we wouldn’t be able to. 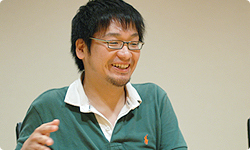 We were like, “Then let’s go with it!” (laughs) We’d been calling it Monster Hunter ever since we started development, so it had come to contain our image of the kind of game we wanted to make. Of course, we’d grown attached to it so it was great we could use it for the title. And once you hear it, you never forget it. Having a sense for words is important. 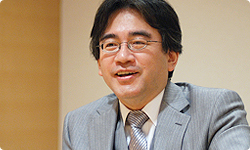 I’ve talked with Shigeru Miyamoto several times about what a great name it is. It’s easy to remember and makes an impression. You understand right away what the game is about. Thank you. I think it was incredibly good luck that we were able to use that title.